The year is 1990, and a beautiful young French woman named Veronique aspires to be a singer. In Poland, another woman named Weronika has similar aspirations. One would be forgiven for believing them to be one in the same due to their strikingly identical appearance. This story follows both women, detailing the highs and lows of their lives. Though they will never formally meet each other by the time this story ends, they share an esoteric connection that transcends language and culture. The Double Life of Veronique is Krzysztof Kieślowski’s first notable work after the ten-part television drama series Dekalog and the two feature-length films that expanded upon its fifth and sixth installments. It too is highly revered among critics, having performed well at the 1991 Cannes Film Festival and being a favorite of Roger Ebert’s. It was even selected as an entry for Best Foreign Language Film at the Academy Awards ceremony, but not ultimately accepted as a nominee. What caught my attention immediately once the film began proper was the cinematography. Barring a few notable exceptions, Mr. Kieślowski had a propensity of filming things as they were in Dekalog. 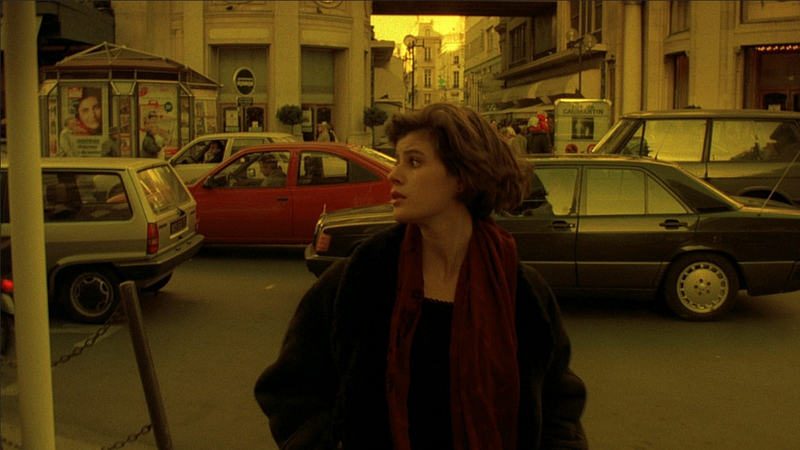 In The Double Life of Veronique, he makes extensive use of filters; many scenes appear to be set in a land of perpetual sunsets. This lends the film an ethereal, dreamlike quality that is a significant contrast to the down-to-earth, realistic style found throughout Dekalog. Given the metaphysical nature of the film and how it deals with an inexplicable subconscious connection, this is highly fitting. 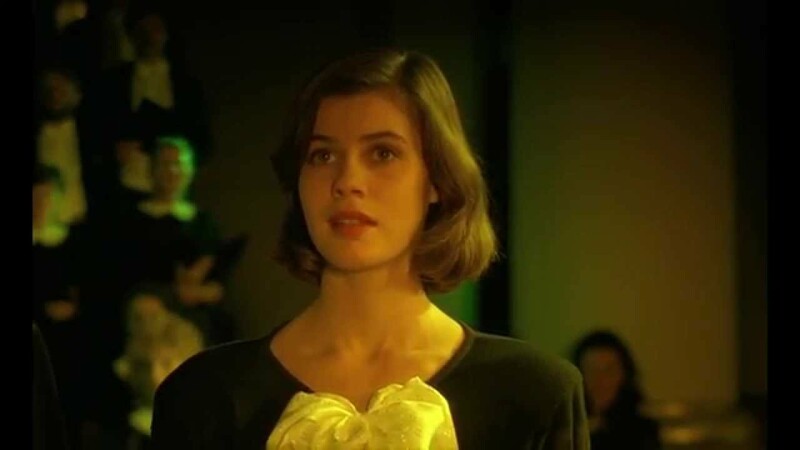 To further enforce this connection, Veronique and Weronika are both played by the same actress: Irène Jacob. I have little doubt that, from Ms. Jacob’s perspective, one challenge of making this film was portraying these unusually similar women in distinct ways. Though it’s a little difficult to pick up on during one’s first viewing, I never got the impression that she was portraying the same person just in different locales. Indeed, I have to admit that I did not realize they were both portrayed by Ms. Jacob; I assumed only Veronique was. I feel this is likely because although the two characters are nearly identical in appearance, their decisions give them entirely different personas. Whereas Weronika has no reservations pursuing her dreams, Veronique seems more likely to address her obligations to the people around her first, namely by teaching music to schoolchildren. There are two defining moments in the film that I feel signpost to the audience what kind of experience they’re in for. The first is when Weronika sees her double boarding a bus. At that point in time, reality seems to have split in two. Weronika seems to, for a fleeting moment, exist on a plane removed from everyone around her as evidenced when a flasher exposes himself and she completely fails to notice. The second forms the basis for the film’s biggest turning point. Weronika sings a solo part in a concert hall only to collapse onstage and die. I can imagine this scene was quite a shock to anyone used to the common portrayal of heart attacks in fiction wherein the sufferer clutches their chest and gesticulates wildly until they fall over. Weronika, on the other hand, suffers a very realistic heart attack. I myself though she merely fainted, I could never have expected someone to pronounce her dead on the scene. There is no drama, no sudden musical cue, and no hammy performance – just straight-up death. At this exact moment, Veronique begins crying as though grieving for somebody, and she admits she doesn’t know why. It’s not as though somebody close to her has passed on, yet the sadness she feels is undeniable. After this, she makes a decision that leaves her singing instructor aghast: she quits. Even after being told that she is letting talent go to waste, she refuses to back down from her decision. She doesn’t even provide a reason for doing so; in fact, it’s questionable if she even has one. As it is later implied that she is taking medication for a heart condition, this decision could have very well saved her life. From there, she falls in love with a man she has never met, a children’s book author by the name of Alexandre Fabbri. After that, her father gives her a package containing a cassette tape. Listening to the tape, she hears a typewriter, footsteps, a door opening, a rushing train, and a musical fragment before they are interrupted with an explosion following a car impact. Taking note of the stamp on the package, she travels to the Gare Saint-Lazare train station café. There, Alexandre tells her he had been waiting for her for two days. This turned out to be part of an experiment to see if she would come to him. An angered Veronique leaves, checking into a nearby hotel. Alexandre arrives and asks for her forgiveness. She brings him to her hotel room, and after he confesses his love, they copulate. Shortly thereafter, she shows him the photos she took during her trip to Poland. Among them is one of a young Polish woman bearing a striking resemblance to Veronique. When Alexandre asks about it, she insists it isn’t her. He then reads to Veronique a new book about two women born on the same day in different cities. One burns herself on a stove, and when the second finds herself in the same situation, she pulls her hand away despite being unaware of the consequences. Later in the day, Veronique stops at the gate in front of her father’s house and touches an old tree. Her father appears to sense this without observing it. In the hands of the less talented, I could easily read this film as an anti-science parable. There is no scientific explanation that explains how Veronique, much like the girl in Alexandre’s story, was able to avoid an untimely death. She would have no way of knowing of Weronika’s death, yet she avoids meeting the same fate – as though her doppelganger’s final experiences bled into Veronique’s consciousness. At the same time, there have been many provable instances of similar things occurring in the real world whether it’s people recovering from the brink of death or being able to tolerate twice their normal pain threshold simply by listening to their favorite music. Rather than dismiss the events of this film as a trite fairy tale, you’ll be wondering to yourself if you ever made decisions similar to the life-saving ones Veronique makes. Of course, now that Weronika is dead, it has a treasure trove of implications as to what Veronique will do from there, but before they can be fully explored, the film ends. Personally, I feel this was for the best. From the very first minute of his film, Mr. Kieślowski challenged its audience to think for themselves, so ending on an ambiguous note was the single most courteous thing he could have done. What will become of Veronique without her double there beside her in spirit? Much like where life will take you over the years, it’s difficult to say for sure. When it comes to the subject of arthouse films, Krzysztof Kieślowski stands out as an anomaly. To those not in the know, the umbrella term arthouse generally carries with it connotations both positive and negative. They’re films that speak to the thinking members of the audience rather than just to entertain for an hour and a half. On the other hand, those not sold on arthouse films usually think of a stereotypical depiction of what they entail. They would picture in their minds a French film made up of a bunch of random images. Anyone thinking another step ahead would then imagine the critics clapping like seals at what amounts to a mind-numbingly boring, nonsensical experience. The reason I choose to mention this is because I could recommend The Double Life of Veronique even to those who outright hate arthouse films. The reason I can say this is because Krzysztof Kieślowski did something that was, and arguably still is, exceptionally rare among artistically inclined directors – he attempted to bridge a gap between his work and his audience. The stereotype of the moody director who slavishly shoots every scene with meaning and lashes out during interviews exists for a reason, and though The Double of Veronique speaks in a very erudite language, it never talks down to its audience. Indeed, this film is particularly admirable in how it causally introduces a metaphysical narrative and expects those who watch it to keep up. Now, when I say I could recommend The Double Life of Veronique to those who wouldn’t consider themselves connoisseurs of the arthouse scene, it’s easy to believe this statement means I think of it as an entry-level effort dumbed down to appeal to the lowest common denominator. In actuality, I would argue the opposite is true. A common problem I’ve observed with arthouse directors as well as the critics who consider themselves fans of their work is that they don’t even make a token effort to reach out to their audience. They’re right, you’re wrong, and that’s the end of it. No, The Double Life of Veronique is essential watching for anyone who fancies themselves the thinking moviegoer – as well as those who don’t. As you watch, don’t be surprised if you begin feeling emotions you have difficulties putting into words. I’m guessing by pseuds, you mean pseudointellectuals? Anyway, I’m not sure if there’s a specific way to “get” this film, but I greatly enjoyed it. Like his other films, it really has a knack for sticking with you long after it has finished. And you’re right, Irène Jacob was amazing. Hehe, yup! 😉 You know those pompous types who wax lyrical about arthouse cinema and scorn anyone who doesn’t get or enjoy it, when half the time you know they are trying too hard to seem cultured with pretentious guff yet secretly enjoy Marvel films like everyone else! It’s interesting that you mention that because I remember asking someone what advantage they felt gamers had over cinephiles, and they took the opportunity to bash the former, claiming them to be anti-intellectual (among other epithets). While I can’t deny that there are some bad apples in the gaming sphere (who are way more prominent than they have any right to be), cinephiles have their own brand of obnoxiousness – even if it’s not as in-your-face. And that would be the behavior you describe – that pseudointellectualism. The behavior seems to have infected large portions of the critical circle, as evidenced whenever they feel the impulse to write an article bashing fans for not liking what they consider a masterpiece/liking something they consider trash. As critics, they should be reaching out to their audience, but they seem more interested in creating barriers and treating the average moviegoer with contempt. That, to me, is the difference between a pseudointellectual and the real deal. The real deal would consider what the audience has to say or have more conviction in their ideals, not go “Nope, you’re wrong. End of story”. Also, I find it immensely hypocritical how the allegedly high-minded critic will condemn the latest Marvel film for being style over substance when every other critical darling as of late seems to be just that. Long story short, there are plenty of problematic behavior patterns among film fans and critics. In fact, I would even go as far as saying that they are in some respects worse than their gaming counterparts in how they’ve effectively normalized said bad behavior. I don’t play games so I’ll take your word for it, but I do know that snobbery, inverted or otherwise it’s also prevalent in music, wrestling and literature too. Sounds like an interesting film experience! Thanks for sharing! I certainly thought it was. Did this review get you interested in checking it out? I highly recommend it. For that matter, I feel you should check out the Three Colors trilogy. They too make for fascinating watches. I hadn’t heard of it until I saw your review. It is a movie I might consider. I also hadn’t heard of the Three Colors trilogy! I definitely feel you should. They’re arthouse films that I could recommend to anyone. I’ll be sure to check them out!